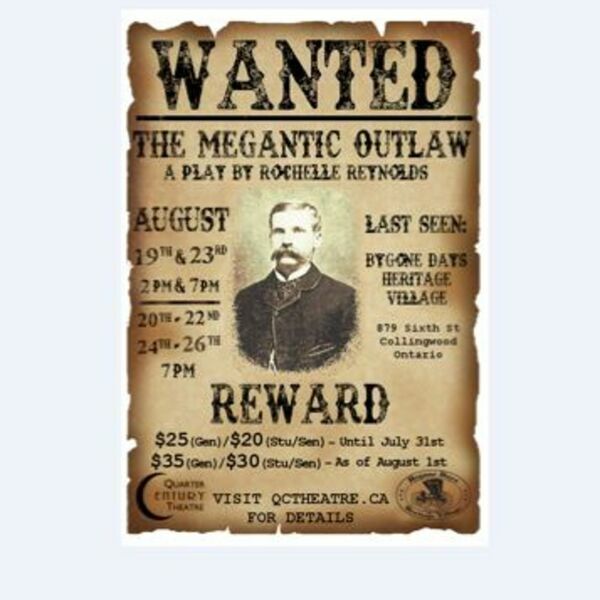 Description: Quarter Century Theatre is proud to present the world premiere of "The Megantic Outlaw" scheduled from August 19th to August 26th at the School House of Bygone Days Heritage Village in Collingwood. The Megantic Outlaw is a drama based on a true story of Donald Morrison, a Scottish Canadian freedom fighter who was wrongfully imprisoned in the late 1800's but with his community rallying support and all across Canada who fought for his acquittal, he was eventually freed. QCT wants to reignite our community spirit with their launch of "FREE DONALD CAMPAIGN". Cast and crew have been thrown into jail with each of their bail set at $250. They are looking at the community for your support for local arts organization by bailing the production team and characters in order for QCT to bring you this historical dramatization. For more information on how you can participate visit: qctheatre.ca/free-donald-campaign. Joining Dianna on this week's BEACH CORNER are founder and artistic director, Rochelle Reynolds and artistic associate, Khaleel Gandhi who will share information about the upcoming dramatization. Quarter Century Theatre is proud to present the world premiere of "The Megantic Outlaw" scheduled from August 19th to August 26th at the School House of Bygone Days Heritage Village in Collingwood. The Megantic Outlaw is a drama based on a true story of Donald Morrison, a Scottish Canadian freedom fighter who was wrongfully imprisoned in the late 1800's but with his community rallying support and all across Canada who fought for his acquittal, he was eventually freed. QCT wants to reignite our community spirit with their launch of "FREE DONALD CAMPAIGN". Cast and crew have been thrown into jail with each of their bail set at $250. They are looking at the community for your support for local arts organization by bailing the production team and characters in order for QCT to bring you this historical dramatization. For more information on how you can participate visit: qctheatre.ca/free-donald-campaign. Joining Dianna on this week's BEACH CORNER are founder and artistic director, Rochelle Reynolds and artistic associate, Khaleel Gandhi who will share information about the upcoming dramatization.